If this claim holds true then we must examine the way in which art crosses borders, how styles and stylistics exist as codes that are bigger than any national territory and, as such, hold more importance than a passport representing a single nation. This undertaking is especially important today, with the emerging tendency of a re-nationalisation across the European continent. Being part of a generation that grew up with the transnational project of the EEC (the European Economic Community that became the European Union), and having witnessed the collapse of the iron curtain, history seemed to be moving inexorably towards diminished national control and a wider transcontinental identity. This identity was necessarily rooted in a commonly shared cultural history and, implicitly, the art styles of the 20th century which themselves came from diverse national backgrounds: Expressionism, Constructivism, Dada, Pop – the list is long. 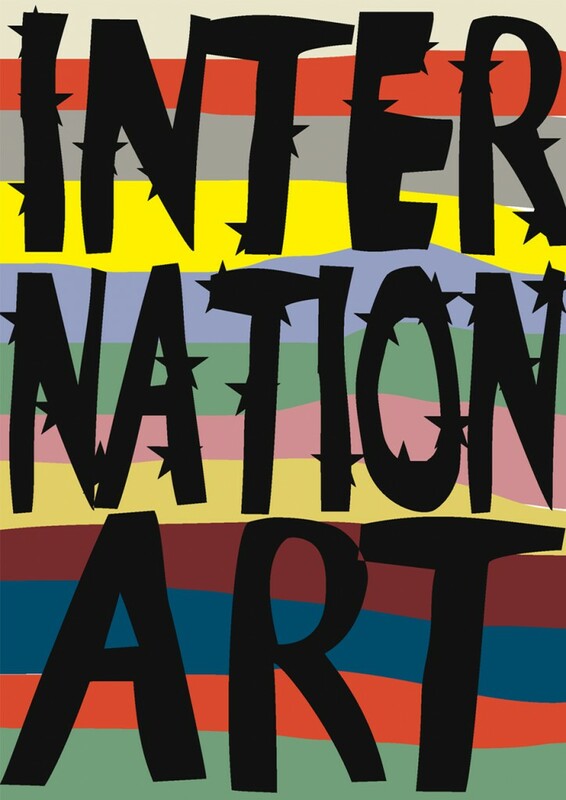 Inter Nation Art shows a generation of European artists that shared this experience. We will bring their art works to Zagreb, a city that experienced quite the opposite some twenty years ago: The collapse of a multi-ethnic state. These days, European unity is questioned and criticized from the political left as much as from the political right. It’s defenders are in a defensive position. Our common culture though, be it film or music, literature and of course the visual arts with its international biennales and festivals, too are – and have always been – a cross-national culture. This exhibition holds no manifesto and does not proselytize. It looks on Europe through the eyes of several artists with different European passports or different European origin. Each of the 28 exhibiting artist works the same format: A flag. The flag being the most common representation of a country becomes the medium for the artists to express themselves. These 28 art flags will be hung within the round gallery of the HDLU pointing to an inner center. The flags will be moved by fans which will produce a constant swoosh within the very special, echoing architecture. The musician Thomas Mahmoud-Zahl will contribute a sound performance in the opening night deconstructing Beethoven’s “Ode an die Freude”, the European anthem. Most of these artist stem from a generation for whom European unity manifest and was experienced in student exchange programs, international family ties and a socialisation in (sub-/pop-)cultural movements that are truly international. To this generation European identity and unity comes natural. Other contributing artists come from the generation that was actively involved in constructing this new Europe. 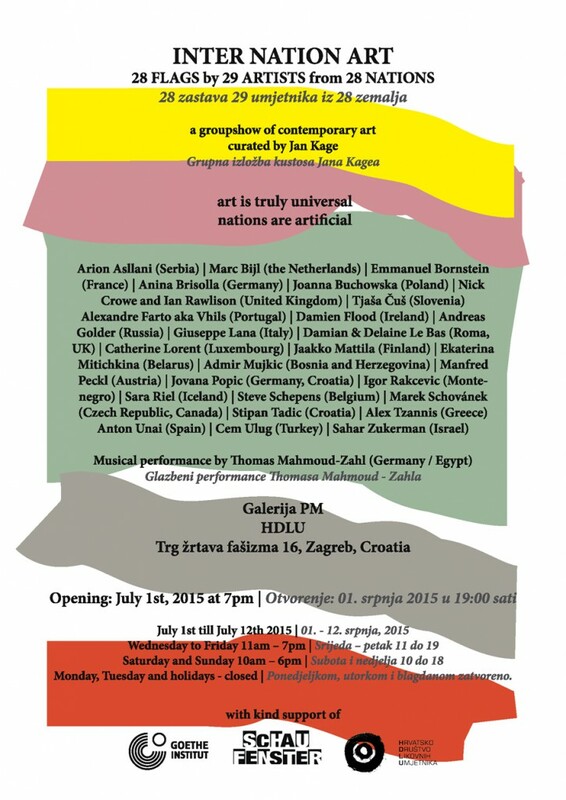 The show is curated by Jan Kage for HDLU, Zagreb, Croatia by invitation of Josip Zanki. Jan Kage is a curator from Berlin who besides running the art space SCHAU FENSTER is putting together a cross-media clubnight called Party Arty since 2002 in Berlin, Germany. Kage also host the weekly radio show Radio Arty on Berlin’s FluxFM and writes for different papers, websites and anthologies. So Inter Nation Art wants to talk about a status quo through art works. What better way is there to reflect upon the state of the union than through the uniquely contemplative quality of art? The Culture Trip is a one-stop, global website, showcasing the best of art, food, culture and travel for every country in the world. 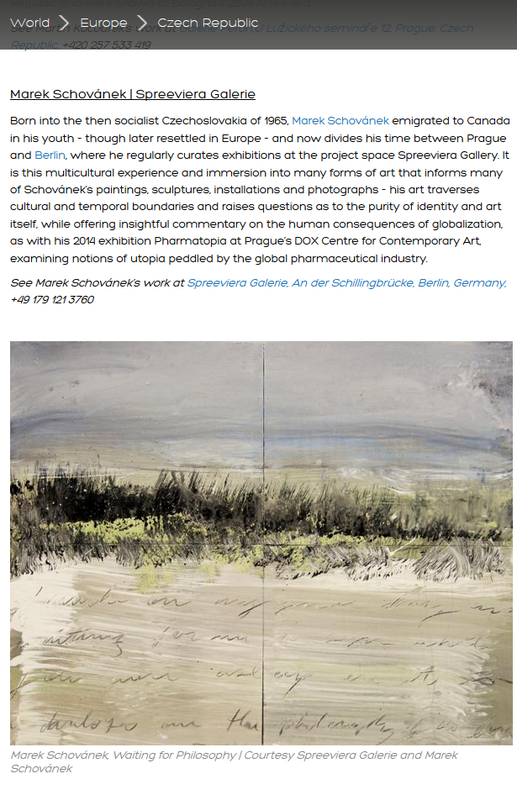 Recently they published “Czech Republic´s 10 Contemporary Artists ans Where to Find Them” and they found me… Enjoy reading! An einem der Öffentlichkeit bisher unbekannten, nun freigelegten Stück Mauer ist eine einzigartige Galerie mit besonderen Maßen entstanden. 25 Jahre nach dem Fall der Mauer öffnet das Yaam gemeinsam mit den Galerien Spreeviera und Urban Art Clash die Ausstellung WALK THE LINE und einen neuen Ort für die Kunst. Die Galerie ist so schmal, dass immer nur einige wenige Besucher gleichzeitig Eintritt bekommen. Beinahe allein sind sie dann in ungewöhnlicher Nähe mit der Kunst konfrontiert. Der Besuch in der West Side Gallery ist geradezu ein körperliches Erlebnis. Kuratiert von Marek Schovánek und Alesh One ist aktuelle Urban Art zu sehen, sämtliche Werke sind im Miniaturformat, nicht größer als DIN A 4. 2014 feiert Berlin das Jubiläum des Falls der Berliner Mauer im Jahr 1989. Anläßlich des historischen Ereignisses finden das ganze Jahr über Veranstaltungen und Ausstellungen statt, die sich mit dem Bau der Berliner Mauer, der Teilung Berlins, dem Kalten Krieg und der Friedlichen Revolution von 1989 beschäftigen. Höhepunkt ist das Wochenende 08./ 09. 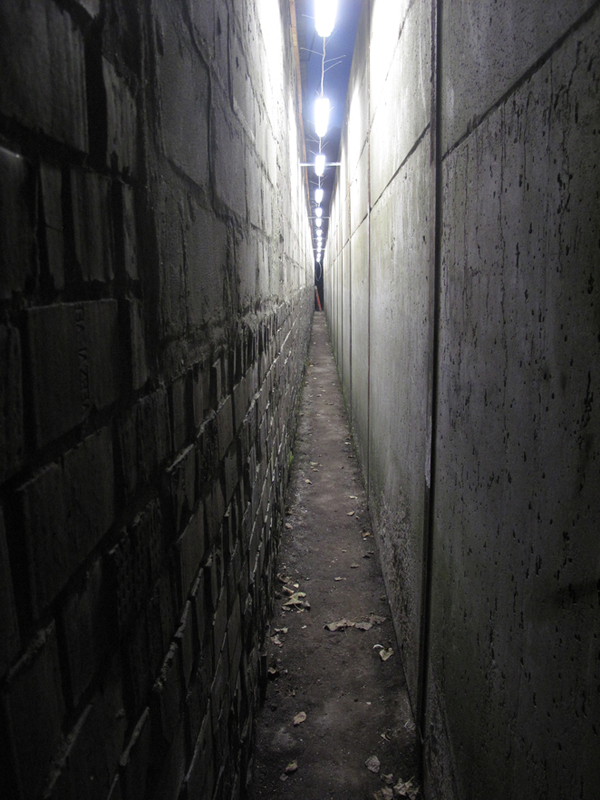 November 2014, an dem entlang des ehemaligen Mauerverlaufs quer durch Berlin eine große Licht-Installation zu sehen sein wird. Das Urban Art Clash Kollektiv und die Spreeviera Galerie eröffnen im neuen Yaam an der Schillingbrücke eine Ausstellung, die sich mehr als nur mit dem Thema “Mauerfall” beschäftigt. Spreeviera Galerie is situated in the art yard of YAAM. Enter the area An der Schillingbrücke, 10432 Berlin, keep to the right towards the river Spree. Walk through the “Chapel”, along the water to find the beach, then turn right and right again. The exhibition is an antidote to the ravages of propaganda and modern fear mongering. The manipulation of fear and the exploitation of primal plots is a front to the narrative of life the overuse of which negates the primal and natural function of basic instinct. What do we personally define as dangerous? Anthrax, economic collapse, terrorism, social disenfranchisement? What is the manipulation of fear and danger? The beauty myth, the future, phobias, existential realities, yourself? Can you burn out the danger response? Override nature’s circuit board and dull the primary natural senses? 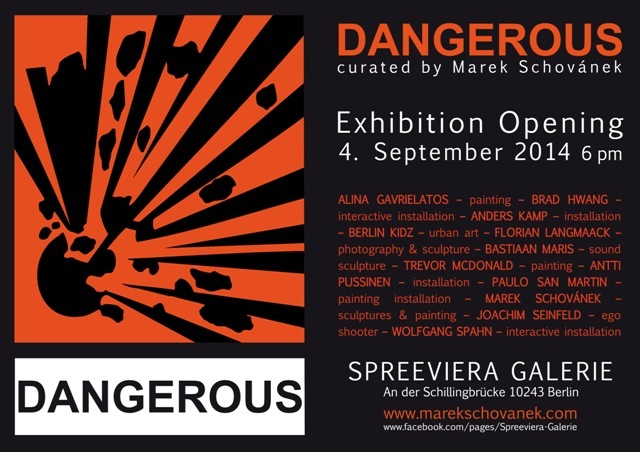 DANGEROUS explores artistic definitions of what encompasses danger. Be it lies and historical puppetry as in the installation from Wolfgang Spahn, self-reflection and the cost of being a hero in the installation by Joachim Seinfeld or a sweet surprise danger in exploring the relay boxes of Bastiaan Maris. Women, weaponology, murder props, art as risk or sport are some of the many positions represented in the exhibition installation. 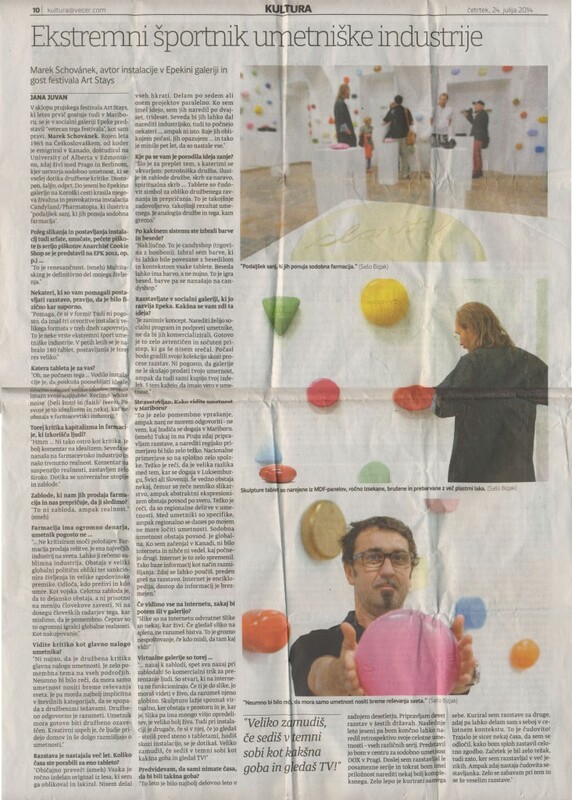 One of the biggest newspapers in Slowenia printed a whole page on my exhibition in Maribor.